First of all, awesome name. 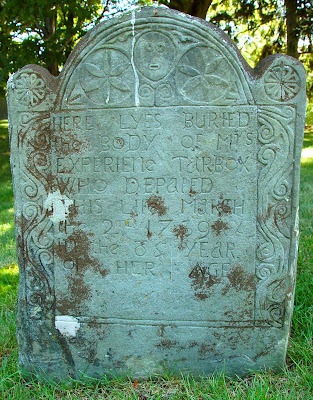 Add Experience Tarbox of Wenham, MA to the list of the "depated." Wenham Cemetery gets its best light in the late afternoon. Unfortunately, I was there at 11 a.m. and couldn't hang around all day. I had a tiny mirror, so Pete helped me illuminate the relevant part of the inscription. Notice the strange mix of upper- and lower-case letters and the crossed capital Is.